Simply cheap is no longer the most important requirement of food discounters. Today’s consumer demands more freshness, betterinformation on the origins and the ethics of the products, it must be organic food and it certainly does not harm to have the possibility to buy fresh fruits and a new TV or fitness device all in one store. Are discounters becoming more and more adequate supermarkets? Driven by demanding customer needs and challenged by the competition, that responds with more and more own brands the distribution policy of discounters has experienced a metamorphosis in recent years. In the past the presentation of goods played a minor role, whereas the price-performance ratio has played the key role. The price is still important, but there is a clear development towards full-fledged supermarkets. The demands on discounters are constantly set higher and higher and vary from country to country. If there is already a high location density in a country, like in Austria or Germany, small catchment areas are the answer. Accordingly, the pressure for optimization of the operation type towards "normal" supermarkets with price leadership is higher. If we, for example look at the development of the average sales area of newly opened stores of Aldi North and South in Germany, it appears that the average sales area rose from 810 in 2005 to 980 in 2015. The same is noticeable with the number of articles. While the average number of articles in Germany was around 1,850 in 2005, it already rose to 2,250 articles in 2015. The discounters started at that time with just 450 articles. 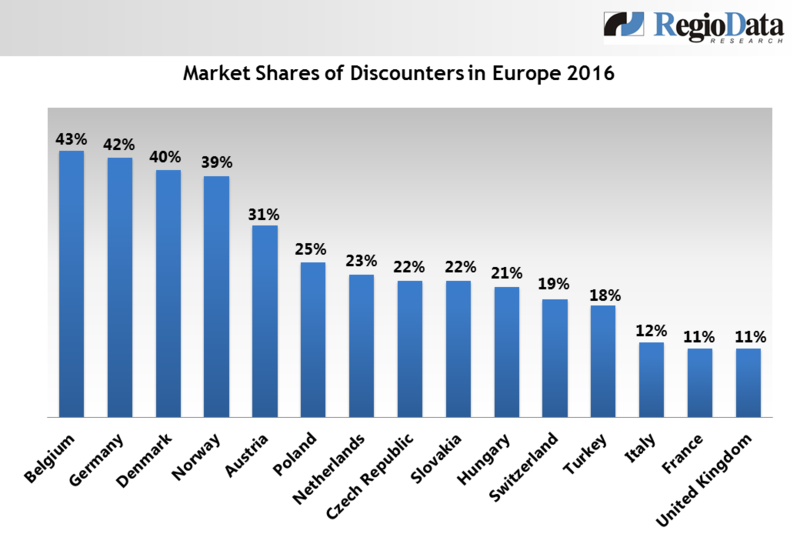 In general, there is a tendency towards more discounters throughout Europe. At the turn of the century there were around 30,000 stores, now we are at about 45,000. Over 16,000 of those are located in Germany. But the other European countries are also involved in this process. With a market share of 43%, Belgium comes in 1st place, closely followed by Germany in second place with a market share of 42%. In 2012, it was said, that at 35% market share the food discounters reach their limit. It seems like the metamorphosis widened the limits.